 A lively account of Clara Barton's life during the Civil War that reveals both the character of this compelling woman and the awfulness of war. Oates (Abraham Lincoln, 1984; Let The Trumpet Sound, 1982) quotes liberally from her voluminous correspondence, much of it apparently written with an eye toward publication. Beginning his story with the opening days of the war, when Barton was working in the U.S. Patent Office in Washington, D.C., Oates gives a vivid portrait of life in the wartime capital. Within months, Clara, as he always refers to her, became a one-woman relief agency, collecting clothing, food, whiskey, and medical supplies from women in her home state of Massachusetts and distributing them to soldiers. She persuaded officials to let her take her supplies onto the battlefield at Antietam, becoming the only Northern female nurse to serve under enemy fire. Later she served at the battles at Fredericksburg and Battery Wagner, and when the fighting ended, she aided in the search for missing soldiers, a task that took her to the notorious Andersonville prison. Oates makes much of her brief fling with a married man, Colonel John Elwell, even providing details of mid-19th-century contraceptive methods, although there is no evidence that Barton or her lover used them. He claims that this is the story Barton wanted told. Maybe, maybe not. Her bravery under fire, her drive and endurance, her sense of duty and propriety, her ability to rouse public support for her relief efforts, and her skill at manipulating the military and political bureaucracies are all shown here, but so are her depressions, her inability to work within existing nursing and relief services, and her outrage when other women infringed on her territory. 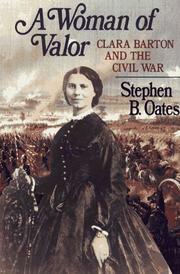 Splendidly detailed narrative with special appeal for Civil War buffs and lovers of history--and herstory. Includes maps--not seen.